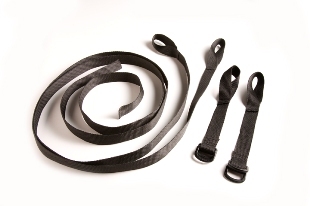 This strapping system is a refreshing alternative to bungees. The system is composed of four pieces. 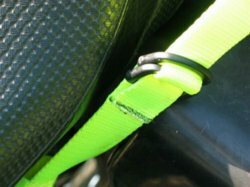 The strapping fabric is 1" wide polypropylene- will not break down in sun or rain. Incredibly strong. Does not stretch. Two pieces are short (9 inches), looped on one end, with dual D rings on the other. NEW! KISSS-PLUS- has a quick release in the short strap! The other two pieces are long (5 foot), looped on one end and flat on the other. 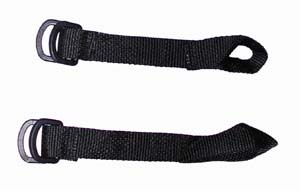 To use, they are looped around a strong frame member opposite each other, gear is placed on rear seat, the straps are secured over the gear, the flat end is looped through the D rings and pulled tight. 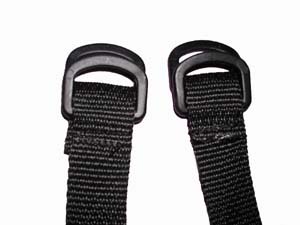 They can be pulled tight without fear of stretching fabric or breaking d-rings. Tuck in the ends and away you go! 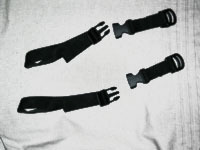 Some gear can be secured in an X fashion; some may work better with the straps parallel to each other. Shipping rates apply to U.S. postal addresses only. Canadian addresses may cost more. custom lengths available. I also usually have some other colors too! (apache pattern, etc.) Contact me at info@dwapickle.com for more info and for custom color availability.